We just finished up our first month of Lunch and Learn classes and they went really, really well. Everyone gets a boxed lunch to have while we demonstrate a technique or series of techniques on how to do a certain something. This month we concentrated on items from garment instruction: Buttonholes, Collars and Cuffs, Hemming and Zippers. Did you know that a lot of these techniques can be used in not just garments, but in quilting and home decoration? All the things Mom went over are designed to make you smarter, think harder and know how to do more. When we have a 45 minute to an hour demonstration class, we spend an average of twelve hours preparing for it. The little samples that we pass around have to be created and recreated so they are at various stages of "finish" so we can show what the next step is. And we research, learn and do the homework on how to create whatever we are working on. Yesterday when Mom did her Zipper demonstration, she used at least five different presser feet! There are so many ways of doing just one thing and our goal is to show you lots of different options so you can apply it to your next project with ease. 1) "I learn by doing, not by watching"
2) "I already know how to do this"
3) "It will never pertain to my sewing"
I'd like to address all three of these points. I learn by doing as well. I like to get my hands on whatever I'm trying to figure out and touch and feel my way to where I need to be. But you need a good base of information in order to go home and try the technique out. My mom has been teaching me things for the past (a-hem) 40+ years and I still hear her voice in my head when I'm using my fingertips dipped in water to make a fine crease after turning something. I can close my eyes and see her teaching me how to make a dart-- have you ever put a needle at the bottom of the dart and wrapped the thread pulled from the needle around it to give you a perfectly straight stitching line? She had to show me first. And even after I learned to do it, I still hear her telling me what to do. "I already know how to do this": This one is easy. You might learn something new. You might find an alternative way of doing something that you hadn't thought about before. You might pick up a "pearl" of wisdom-- one thing that might make things easier and more efficient. "It will never pertain to my sewing": Buttonholes can go on the backs of pillows, on the top of shower curtains, on a handbag, on a clutch, You don't just hem pants, what about knowing how to do a blind hem at the bottom of a curtain to give it a neat, professional finish? Everything we learn builds on top of the last thing we learned. Keep that in mind. Make a mountain of knowledge. We are proud to present the Lunch and Learn Series, and hope you'll join us again soon! Last night we had our first "Dinner and a Dream" night. It was so much fun! We had eight guests for dinner, and many of the ladies had never met each other before. We all introduced ourselves and then we were served a fancy meal of Herb Crusted Chicken with Roasted Potatoes, Asparagus, and Garden Salad. 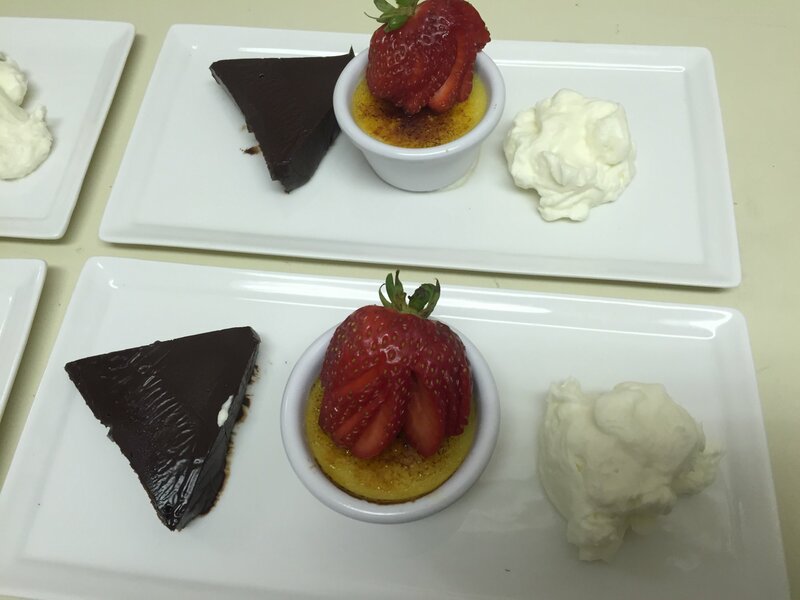 For dessert we had Chocolate Ganache Torte & Creme Brulee with Berries & Vanilla Tuile. Honestly, I didn't have any idea what "tuile" was until I realized it was a yummy whipped cream amazement. I thought the place settings turned out so pretty. We made every guest a place mat and napkin for the meal, and then we made an identical one so everyone left with a set. And it's hard to see, but we made paper doilies from the Scan and Cut 2 for the table! Oh, and check out the flower vase, zinnias cut straight from my flower garden! We were so lucky to have Katrina come and serve the meal to us. She was so kind to come help us out and we wouldn't have had such a great evening without her. During dinner Mom showed off the features of the Brother Dream machine, and when everyone had finished, we went to work on our place mats and napkins. 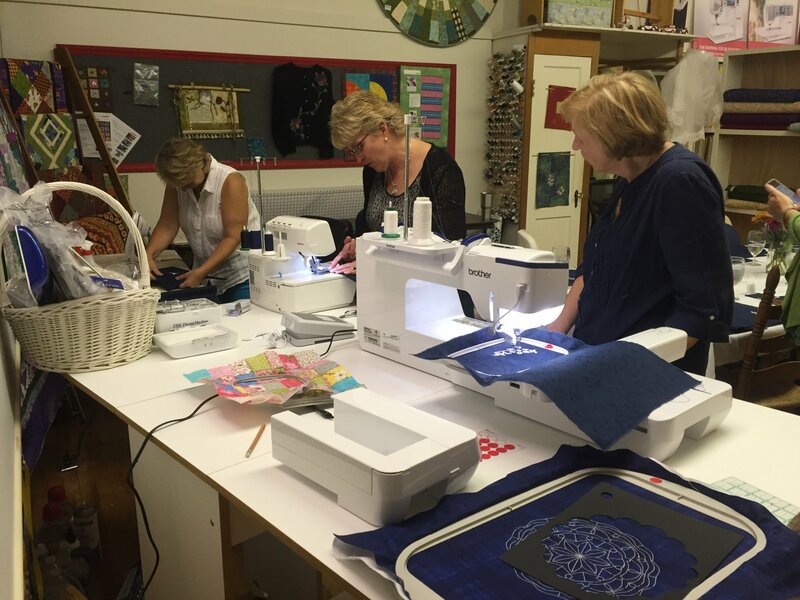 We used the brother Dream machine to embroider, and the brother VM5100 to stitch them up. (One guest was so impressed with that one that she took it home at the end of the night!) 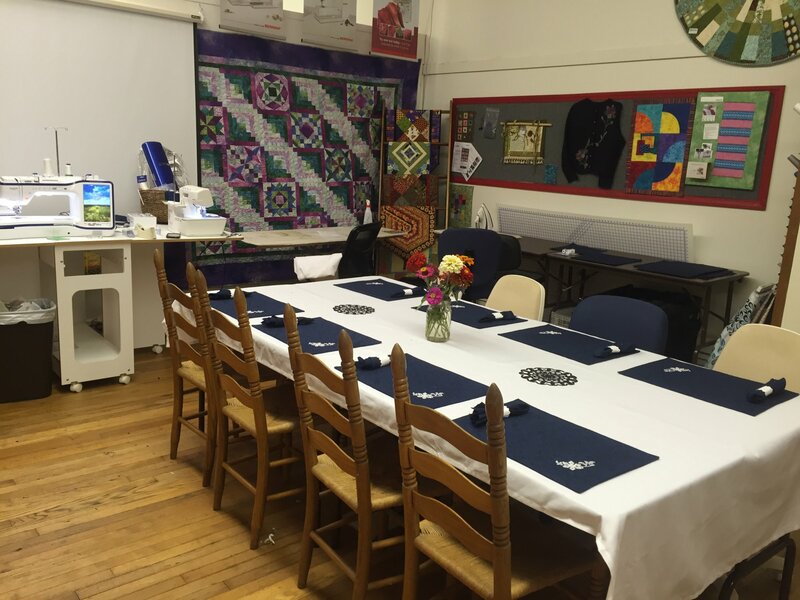 We used the beautiful rolled hem on the BERNINA L450 to make our napkins. 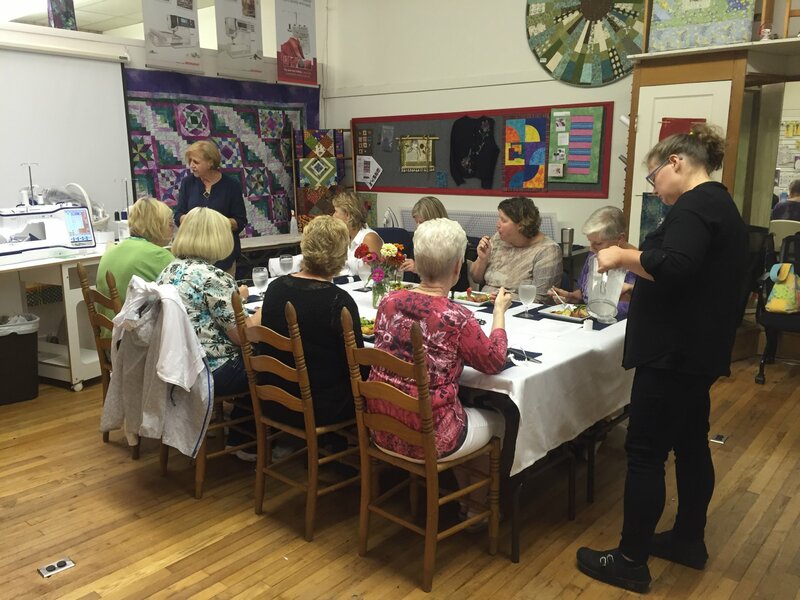 I didn't get a picture of the main course or of the ladies when they finished their place mats and napkins! I'm usually so camera ready but dropped the ball. It was a great night and we are looking forward to the next Dinner and a Dream on October 7th. All seats are taken on this one, but check back soon for a November and December date! We just have to coordinate with the chef-- who I think is pretty darn cute, if I do say so myself!